After getting his start in 1987 as vocalist and guitarist for the Grammy-nominated bluegrass band Special Consensus, Robbie went on to form his own rock band, the Trailer Trash Revue, before going solo. 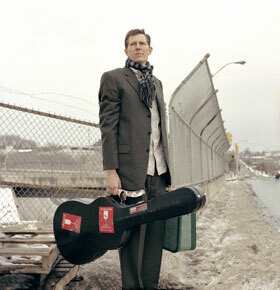 (He has also taught guitar for years at the famed Old Town School of Folk Music in Chicago.) Known for his live shows full of fabulous guitar work, hilarious banter, and unexpected musical juxtapositions, any evening with Robbie is quite a memorable experience. In the inimitable words of the New York Times, "Fulks is a gifted guitarist, a soulful singer with an expressive honky-tonk tenor, and a natural performer. But what really sets him apart is his songwriting, which is one part artful country, one part artful sendup of country and one part a little of everything else... It's sort of country meets David Lynch."